Southern California Marine Photography and misc jabber. 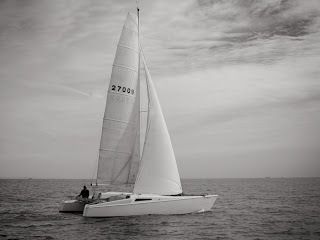 A blog that includes my love of photography and sailing. Photographed off California's Palos Verdes Peninsula. This is a 1980 Phase 2 Warrior Catamaran. Built in Costa Mesa, CA by John Conser of Conser 47 Catamaran fame. This is one of only 8 Warriors ever built. And, perhaps, the only Phase 2 in existence. The Phase 2 cats benefited from additional tooling that replaced all wooden parts with moulded fiberglass ones. The cabin sole is a single full length moulded fiberglass unit. Even the older Phase 1 wooden bulkheads gave way to the newer hat sectioned bulkheads that are considerably stronger and provide more interior space. The original teak cockpit combings or backrests and seats were replaced with beautifully contoured fiberglass. To my knowledge, this may be the only Warrior with a Conser built central moulded fiberglass pod. The pod in addition to having a large deck area and two huge storage lockers it has an ingenious outboard motor compartment that includes a pivoting o/b motor mount. The protected o/b swings down behind the mast where it stays in the water better that a stern hung arrangement. It can be deployed or retracted in just a few seconds with a single line. Although I sold her in 2004, looking at the recent photographs I shot of her with her new owner has lead me to this; a tribute, if you will, to this beautiful and rare catamaran. 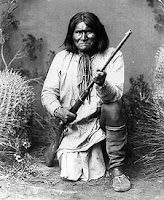 As you may well know, Geronimo was an Apache warrior. This dude actually did bring knives to gunfights and lived to tell about it. In fact, he survived being shot several times. He was said to have special powers, one of which was to walk without leaving tracks. When you watch the Warrior 29 slide through the water, she does so without wakes and with very little disturbance. Some of her design cues come from Polynesia. The Polynesians felt boats should leave the water the way they found it. They knew long ago how to go fast. When Columbus saw them tearing it up in their crazy multihulls he was amazed. It's way more efficient not pushing around all that water needed to make a big wake. As a kid, I remember jumping off of whatever mounds and small hills we could find and screaming "Geronimo!" as we became airborne. I must confess, decades later, it still felt as good when doing 17+ knots, this time surfing down a swell, and screaming "Geronimo!" The boat and I both loved it! Most of my sailing was and still is single-handed. I firmly believe that you don't really own your boat if you can't sail alone. Instead, the boat owns you; if for any reason you can't get crew, the boat has just dictated "you're not sailing today, I don't care how perfect a day it is". Don't get me wrong, it's great fun sailing with your gal and buddies, and you won't win many races single-handing against crewed competitors. But, when your boat is setup properly and sailed single-handed, the solitude and connection you have with the sea, wind, and your boat can't be better. An uninterrupted, silent conversation takes place, bringing you to the present moment, where life is. This Warrior is a single-hander's dream. You don't need to always tend the tiller--she feels as though she rides on rails. The hull shape and updated balanced sail-plan keep her well mannered. When the breeze pipes up she won't work you over. Her balanced rudders, which came from John Conser's prior C-Class Cat development, are refinements of what worked well at all speeds. Even at Geronimo's top speed of 24 knots in the high winds of the 90 mile 2000 Santa Barbara to King Harbor race the rudder blades never once cavitated on me. That SB-KH race saw the capsize and total loss of a 36ft racing cat, broken booms, rudders and shreaded spinnakers. 35 knot gusts were reported. My current boat regularly cavitates at 15+ knots with total loss of rudder control, complete with a 4 foot rooster tail. Looks cool; but isn't! The sail controls have been simplified with beachcat style mainsail/traveller sheeting and a self-rotating mast. If you don't want to be bothered with tacking and grinding the jib, use the custom Bierig self-tacking jib (take another zoomed-in look at the initial blog photo). The rotating half-wishbone internal spar handles the leech tension and camber. Just set it and forget it. If necessary, adjustments are a simple single low-load sheet for changing the jib angle--no winch required. Seriously, to tack just put the tiller over. Don't mess with the main or the traveller or the jib or the mast. You won't be spilling your precious beers, no commotion, easy-peasy. Enjoy the ride! Even flying the spinnaker was something I routinely did single-handed. The ATN spin sock makes it safe and easy. There's so much trampoline area with a 16 foot beam, you don't feel the apprehension (for good reason) of dealing with a spinnaker on the skinny, pointy bow of monohulls and some trimarans. Time for my sandwich & ale. How about sailing single-handed and enjoying your food for a change? Autopilots, when used on tiller driven boats need to be attached to the tiller 18" forward of the rudder rotation axis for proper thrust and travel. The Warrior decks at that part of the stern are roughly 2 feet wide. That puts most of the a/p over the water, awkwardly mounted and completely unprotected. When Geronimo was driving hard you would sometimes see spray extend from the leeward bow and run that hull's entire length. Quite beautiful, but it would quickly destroy the a/p. The central pod became the ideal spot to focus on. When I got the boat, some parts needed to be upsized to take the loads a catamaran of that size and beam could generate. Not only was the traveller undersized and not quite as wide (or long) as it could be, it was attached to the rear beam top with bolts that were only tapped, not through bolted. I got the Harken 'big boat' sized traveller and matching 'big boat car' and made it as long as possible, adding about 18+" additional width so the main could be sheeted further out. With the non-stock square-top main, controlling the twist as far off center as possible is a big advantage. Additionally, this further simplified the rig; there's no boom-vang to deal with. Every single bolt securing the traveller is through bolted--a traveller failure is something I would never have to worry about. The traveller background brings me back to the a/p. I mounted a section of the old traveller inside the pod athwart-ships complete with the matching Harken car. I fitted the a/p pin normally mounted to the tiller on the traveller car and mounted the a/p to the starboard end of the now a/p traveller. As the a/p ram moves in and out it moves the low-friction car side-to-side. Attached to the car are control lines that go around turning blocks. In order to make the pod nice and stiff, John Conser molded in hat sectioned ribs on the underside. As it turned out they represented a hollow from inside the pod floor and the control lines were led through them and exited the rear of the pod where I installed turning blocks to lead the control lines to the opposite tiller. As I remember the exits worked out to be about 5 feet apart with the starboard exit line going to the 18" mark on the port tiller and vice versa. The angle was much better with the control lines crossed. The setup was awesome! The a/p never saw spray, and you could just open the starboard pod compartment door and drop the a/p on the a/p traveller car, with full access to the display and control buttons. Disengaging it was even faster; just lift the a/p up off the car. You were never dangerously hanging over the stern facing backwards. The friction was so low with the Harken gear, you could easily steer with the control lines engaged. Of course, you could easily unclip a control line at either tiller to disengage the car. There are so many level, comfortable and soft places to sit on this 16'x29' catamaran. Grab the a/p remote, your delicious fat sandwich, your ale and enjoy! That's a good looking Warrior you have posted. Coincidentally, the Warrior I own was built in 1977 and has been extensively modified. It has a composite epoxy glass-structural foam integral hard deck and storage area forward of the main cross beam. Also, additional main and aft cross beams have been added that are also glassed to the hulls, so that it can no longer be disassembled. It's a disadvantage for transporting, but makes for a much stiffer boat. The aft part of the hulls were extended by two feet and, althouth the rudders are still transom hung, it now has a reverse transum. Due to a recent dismasting in the Clearwater to Key West race in 2008, the mast, boom, mainsail, and Genoa; roller furling, standing and running rigging were all replaced. The mast, which is a wing cross-section by Spaercraft USA, is four feet taller and the boom is one foot longer. A bow spar, which was on the boat at the time of the dismasting, accomodates a screecher. Hopefully it will be back in the water in a couple of months. This catamaran was sailed to Panama from California by the original owner where it exhanged hands a few times, after transitting the Panama Canal and being returned to the Pacific. I eventually purchased it in 1994 and sailed it to Tampa, Florida in 1997 by way of the San Blas Islands and along the Western Caribbean, after sailing around Panama for a couple of years. Although the accomodations are a bit on the Spartan side, it's a dependable and fast cruiser-racer. I'm anxious to see how it performs with its new rig. See photos of 1977 Warrior Catamaran by following link on Blogspot under "Followers."